Marina Square has recently undergone a $15 million with a dedicated food-restaurant section called The Dining Edition – featuring 16 mid-to-upscale restaurants and cafés. 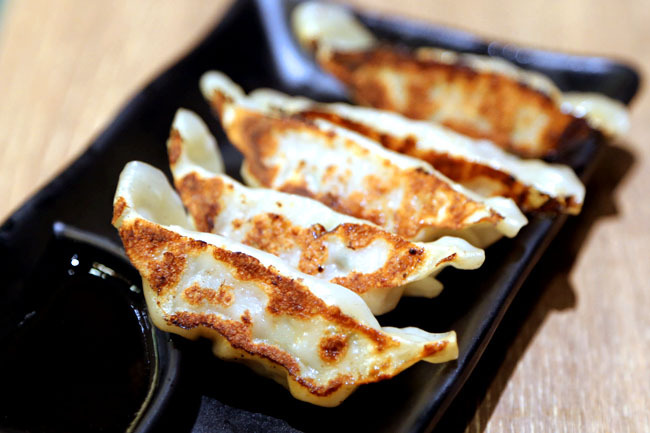 Several of these are new-to-local market brands like Lady M, Carnivore Appetite, Nuvo, Saigon Lotus, Shallots, Supreme Tastes Jiang Nan Cuisine and Hamanoya. Good excuse for Singaporeans to visit this slightly-forgotten mall. If you read this blog long enough, it isn’t hard to predict the first restaurant I would patronise would be a ramen shop. 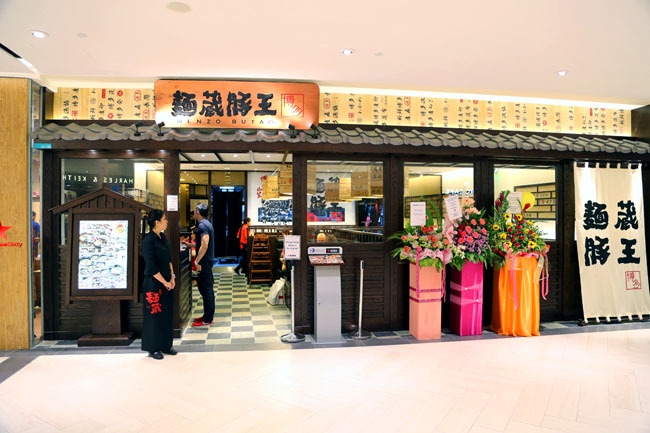 Menzo Butao is new ramen brand in Singapore, though its founder, Mr Yasuhiko Kurata is already well-known ramen producer in Japan with more than 23 branches in Japan and overseas. Menzo Butao’s offerings at first glance feels suspiciously like Menya Musashi with three soup bases of Butaõ (White), Kuroõ (Black) and Akaõ (Red). The suspicion was confirmed when I found out that they were brought in by the same people behind Ajisen and Menya Musashi. 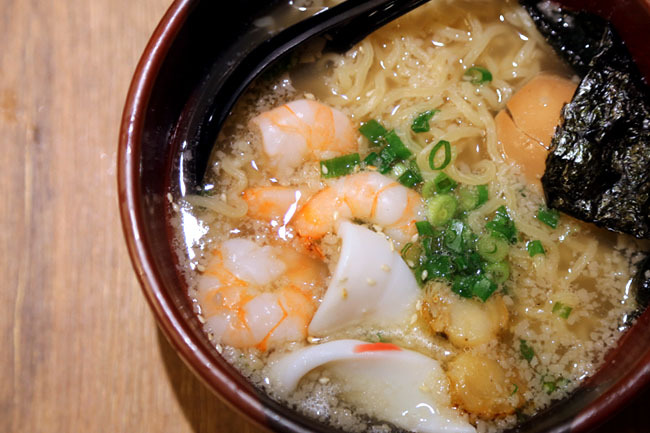 Other than Hakata style ramen, which has the straight, thin, resilient noodles, they also offer the Hokkaido style which is thicker and curlier. 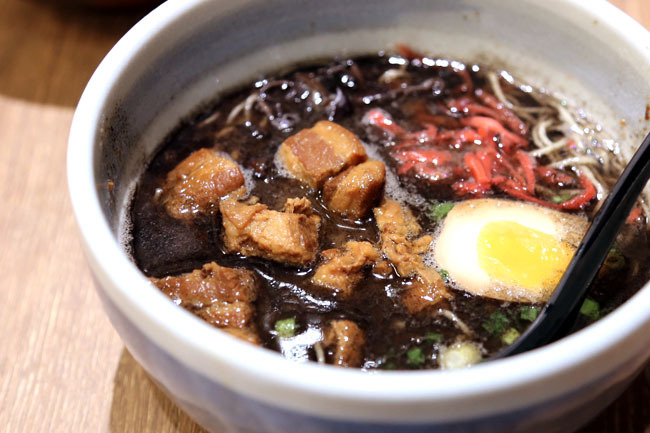 I was recommended the Kuroō Taro Ramen ($14.90), which soup is said to be boiled for over 14 hours with pork bones from Kagoshima, and the black broth as fried shallots and vegetable oil added which makes it more fragrant. I usually have no problem finish ramen broths, though this version felt a little heavy and ‘too-much’. The Hokkaido style Gyokai Seafood Ramen ($13.90) was passable, but forgettable. The soup lacked the warm ‘oomph’ and noodles could have been cooked slightly springier. Overall, Menzo Butao’s ramen is o-kay. 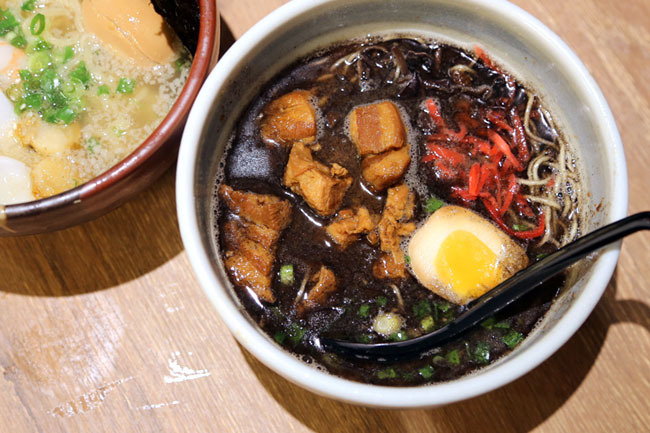 The menu has a huge offering, with close to 30 variations of ramen. But correct me if I am wrong. To me, the better ramen shops in Singapore just serve a few items, and do each one really well. So many ramen restaurants! I wonder if when will be the saturation point. But looks like there’s still room for more for now. I think some more will still open, amongst which few will bite the dust. You really love your ramen. I think I can call you a ramen guru.